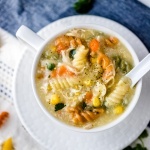 This time of the year where the flu, cough and cold just passing around, it is time for those comforting soup such as this chicken corn soup to shine. See, when you have that dry or irritate throat, no food would work better then these kind of soft & savory soup. I kind of like the idea of everything in one pot, save you the time of cooking, serving and cleaning up afterward. 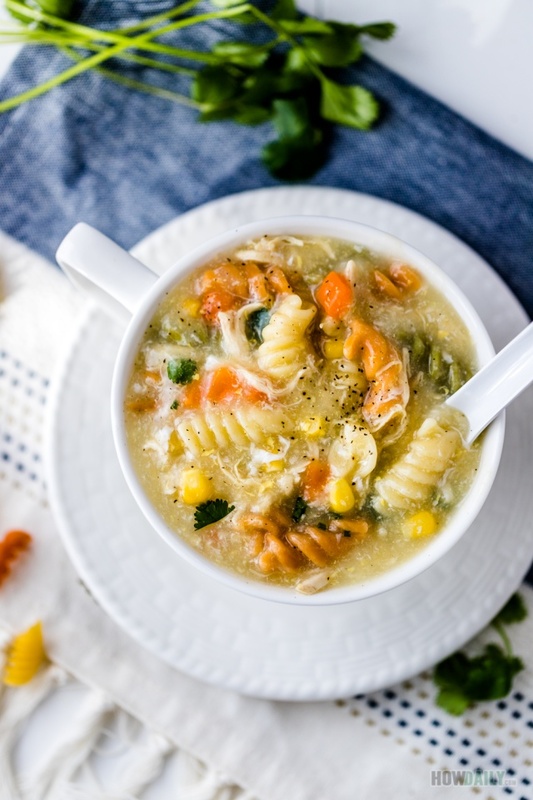 There’s nothing fancy about this soup recipe, just the regular, available year-round ingredients that you could grab from any grocery. 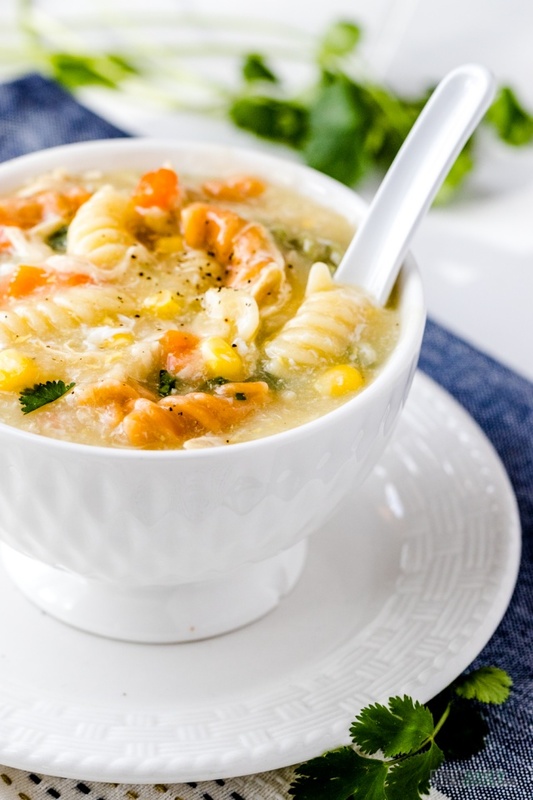 To save your time, I would recommend stocking a few bag of frozen corn kernels or the mixed vegetable to add into this soup. For the pasta, anything you have on hand is fine. I personally like the colorful veggies fusilli or bowtie because of their looks and how my son excited about them. Penne and macaroni work too, or you can cut them in halves. Last note is on the herbs. 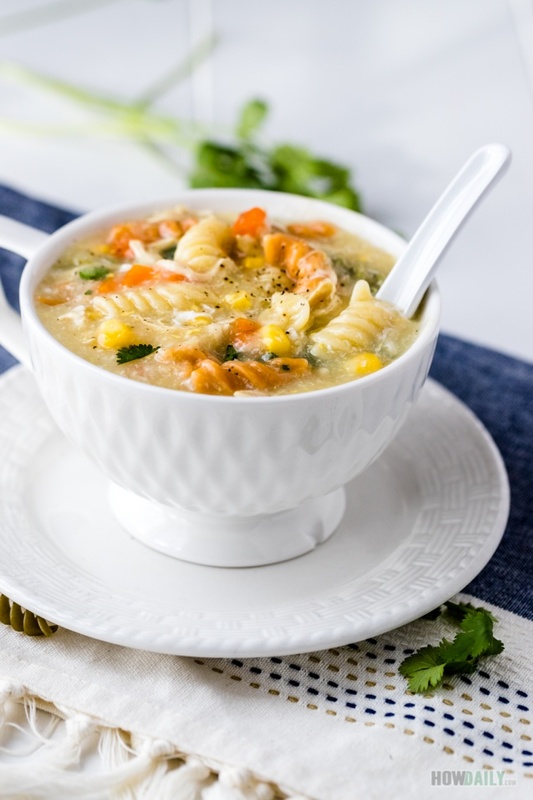 Any herbs can be added to this soup to kick up the flavor and enhance the curing ability. Cilantro is quite nice to keep the taste light, otherwise parsley or other spices would work too. In a stockpot, add chicken broth, chicken breast and bring to boil over medium heat. While waiting for breast to cook, bring another pot of water to boil, add some salt and follow box’s instruction to cook pasta to past al dente. Once pasta is done, strain off the liquid, do not rinse and set aside. Have a small icy cold water bath ready to transfer the breast into once it is cooked. Add corn kernels and pasta to hot broth. Peel and dice carrot and add to pot as well. Bring this stock back to boil then adjust heat to low/simmering. Once chicken breast is cool off to room temperature, shred with a fork then add back to stock pot. Taste test and adjust seasoning with salt if need. Mix starch/flour with 1/2 cup of water, stir well to combine, make sure no white residue on the bottom. Pour that starch liquid into soup pot while stirring to fully mix and thicken the soup. Crack egg over a sieve or slotted spoon into the soup. Stir to fully mix and adjust heat to keep warm while/until serving. To serve: ladle soup into bowl, sprinkle some chopped celery and dash of freshly ground pepper. Enjoy while it hot.